November 2007, Radio Interview with Mr. Sohrab Akhavan On 21 of November, the renowned TV and radio producer and writer Mr. Sohrab Akhavan conducted a radio interview with Manouchehr Moshtagh Khorasani in his program "Yek Ghashogh Shekar" at 9 p.m. L.A. Time that lasted for one hour. Mr. Akhavan asked Manouchehr Moshtagh Khorasani about his book, research and further research projects. The interview was conducted in Persian. October 2007, International Book Fair in Frankfurt 2007  Year of the humanities [PDF] Manouchehr Moshtagh, an expert in the field of Persian art and cultural history, explains International Book Fair in Frankfurt symbols and various images, especially those on Iranian Arms and Armor. "Ich möchte der Öffentlichkeit die Geschichten von iranischen Pahlavanan präsentieren"
Presentation of Arms and Armor from Iran by Mr. Manouchehr Moshtagh Khorasani at the International Book Fair (22.03.25.03.2007) in Leipzig and International Arms Exchange 2007. (22.03.25.03.2007) in Stuttgart at the stand of the Kuratorium zur Förderung historischer Waffensammlungen (Association for the promotion of historic arms collections). 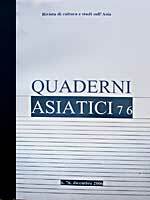 September 2009, Revista de Artes Marciales Asiáticas. 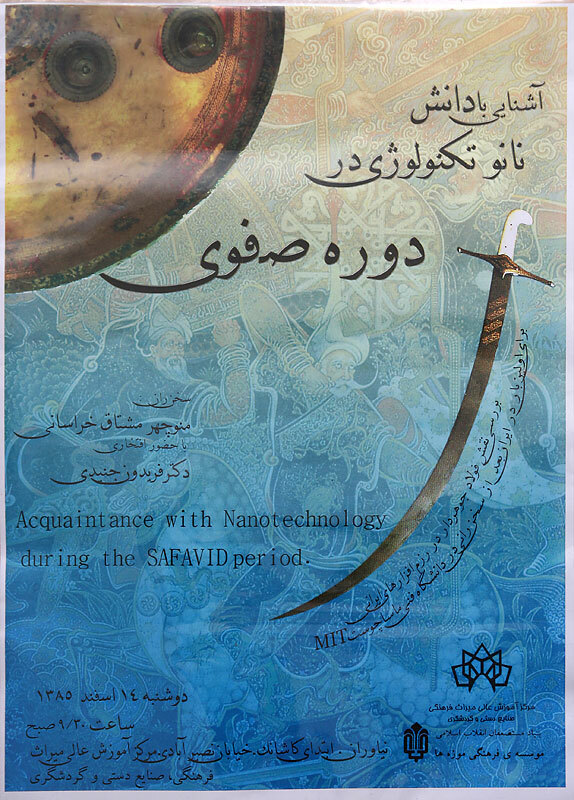 September 2009, Daneshmand [Scientist], Mahname-ye Shahrivar 1388Shamshirhaye Mostaqim Iran: Dandanhaye Ejdeha [Straight Swords from Iran: Dragon's Teeth]. Selahhaye Garm-e Iran: Baksh-e Avval, Tofang-e Fatile-i [Firearms in Iran: First Section, Matchlocks]. Akenakes Madi va Parsi: Selahha va Zerehhaye Iran [Median and Persian Akenakes: Arms and Armor from Iran]. Persian Firearms Part Two: The Flintlock. Las Técnicas de la Esgrima Persa. Persian Firearms Part One: The Matchlocks. Wie Blankwaffen beurteilt wurden. Das Persische „Taìd Besarat" von 1706–1707 – ein detailliertes Manuskript über Schwerter. Um 1196 Beschrieben: Nitrieren mit Entenkot. Edged Weapons: the Pishqabz Fighting Dagger. » I am not the bigest collector, neither I have the most complete library on arms and armor. But the book of Manouchehr Moshtagh Khorasani is trully outstanding ! Everyone knows "similar" books which are available on the market today. Some of them have very nice pictures and short description of the pictured items. Unfortunatelly some other books have only nice pictures and "fairy tales" about the pictured items. 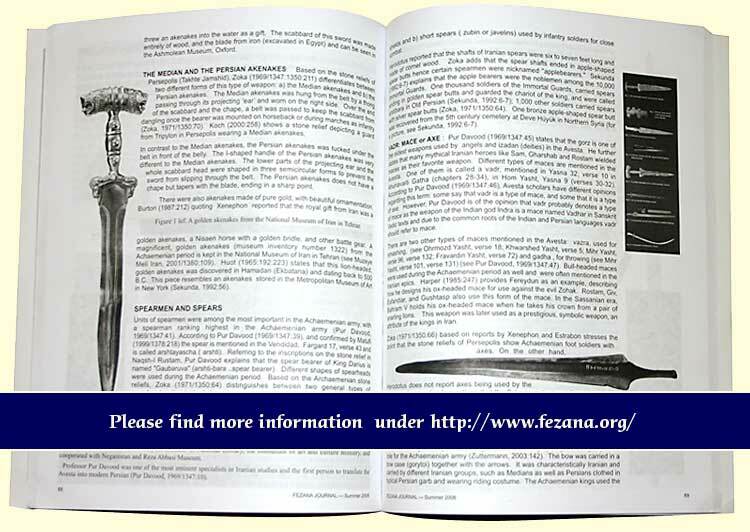 "Arms & Armor from Iran" is many PARASANGES forward in comparison with any other book writen on this subject. Is a great work which impresses not only collectors and people who have knowledge about the subject, but also any simple and occasional reader who 'll hold the book in his hands for a short time.The perfection of Manouchehr Moshtagh Khorasani's work, shows not only the high level of his scientific knowledge on arms and armor of his home country, but also his pure love to them ! 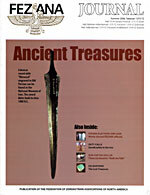 In few words, it can be the "BIBLE" or "QURAN" of any serious or amateur collector ! » … your book on Arms and Armour from Iran arrived this week, to join other revered works in the Library of the Antwerp Etnographical Museum (Belgium). On arrival, it had caught the eye of the museum staff, as its physical presence is impressive... But the "Near Eastern" area specialist was delighted with the acquisition! And for me, it will be an equal delight delving into the contents. » … I iust received the book and it's too early for a review of it that would do it justice as it's going to take some time to read it all ! But a first impression just flipping the pages and looking at the photographs is ALL GOOD. 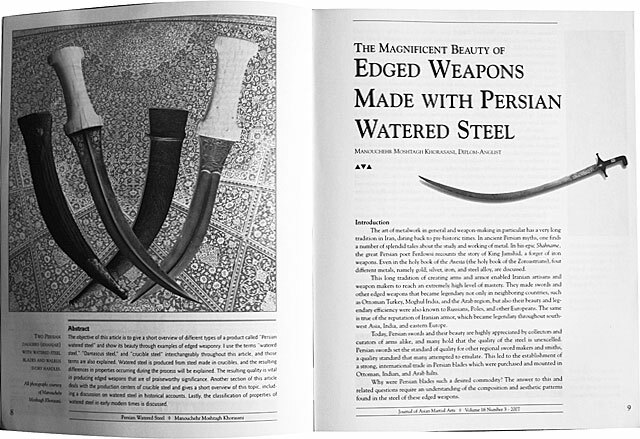 It seems like the subject is treated in much more depth and variety of approach than the usual picture book that touches mostly on the art history aspects and a bit of history: Again, at a glance, there is a full historical background and a lot dealing with the use and design of Iranian weapons and armour. Exactly the sort of thing one wants to read when one's interest in in historical weapons and what most " scholarly books " written by art historians or museum curators usually don't mention at all. There are parts of the book dealing with such various things as the physical fitness exercises used traditionally by Iranian warriors to build strength and stamina. ( just one thing out of many I have just had time to skim. There are months worth of reading here and enjoying eye-candy ). The price was fully worth it for me..
»Prior to ordering this publication, I read all the other reviews so there was already a built-up expectation of excellence in what I was to discover when the book arrived. I can unequivocally, that not only did the reputation prove correct, but in every way, the book still exceeded what I was to expect! The text is extremely detailed, the images fantastic, the construction of the book is of the finest quality. For most subject matters, one must build a large reference libary of many publications to give you the volume of information this one book provides. The price is steep but when you consider that it really is several books in one, it still proves to be a bargain. I think it would have been reasonable to publish this massive publication in multiple volumes which the buyer would then have to purchase individually and the sum of the prices would easily equal or surpass this publication's price. 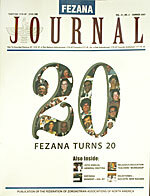 The author was highly privileged in accomplishing the impossible in his access to most of the artifacts he fully displays from Iranian military museum collections closed to the general public. This book opens the door, for the first time, to enjoyment and study of rare ancient weapons and armor that have never been seen before by the vast majority of the world. » My book by Khorasani arrived this morning and is absolutely beautiful. It is in perfect condition, arrived promptly, and it is a great pleasure to own. Please tell Mr Khourasani that he has made someone very happy and that my only regret is that I will never be able to see all the swords he has talked about. 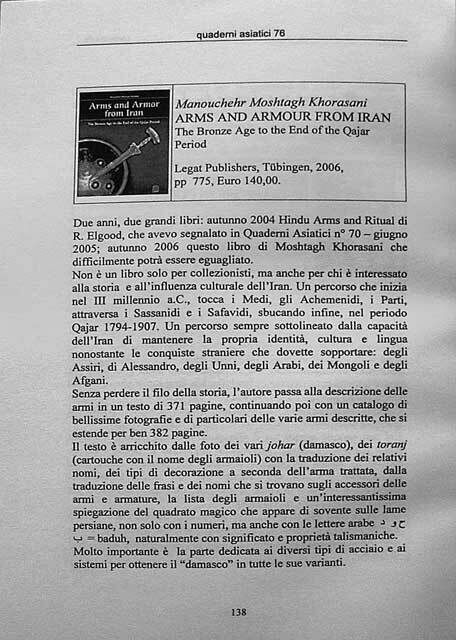 »… I just received the book "Arms and Armour from Iran" by Manoucher Moshtagh Khorasani. It is at first sight at least very impressive with its 776 pages, more than 3 thousand images and a few kilos! It is a monumental work describing the time line of arms in Iran, in a way that even the less educated in Iranian history will understand it easily. » I just received your book a few hours ago. It is, besides from being heavy, very impressive, with very good pictures and a lot of details  I am looking forward to start the reading, as I am sure the text will be very interesting.